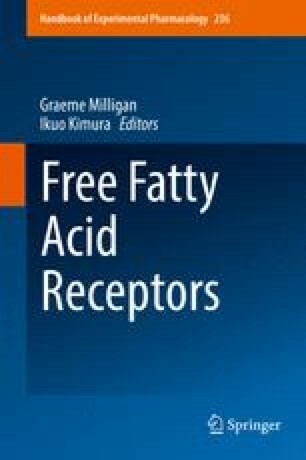 A large number of reviews and commentaries have highlighted the potential role of the short-chain fatty acid receptors GPR41 (FFA3) and, particularly, GPR43 (FFA2) as an interface between the intestinal microbiota and metabolic and inflammatory disorders. However, short-chain fatty acids have very modest potency and display limited selectivity between these two receptors, and studies on receptor knockout mice have resulted in non-uniform conclusions; therefore, selective and high-potency/high-affinity synthetic ligands are required to further explore the contribution of these receptors to health and disease. Currently no useful orthosteric ligands of FFA3 have been reported and although a number of orthosteric FFA2 agonists and antagonists have been described, a lack of affinity of different chemotypes of FFA2 antagonists at the mouse and rat orthologs of this receptor has hindered progress. Selective allosteric regulators of both FFA2 and FFA3 have provided tools to address a number of basic questions in both in vitro and ex vivo preparations, but at least some of the positive modulators appear to be biased and able to regulate only a subset of the functional capabilities of the short-chain fatty acids. Significant further progress is required to provide improved tool compounds to better assess potential translational opportunities of these receptors for short-chain fatty acids.